There has been some discussion recently on replacing the Arlington Street bridge in Winnipeg. This bridge was built in 1912 (in Birmingham, England!) and spans the CP Winnipeg yard and is due for replacement soon. Railfans know this bridge as a good platform for watching trains from above, and it is in the backgrounds of many Winnipeg yard photos. The yard itself has come up in conversation with respect to railway relocation. 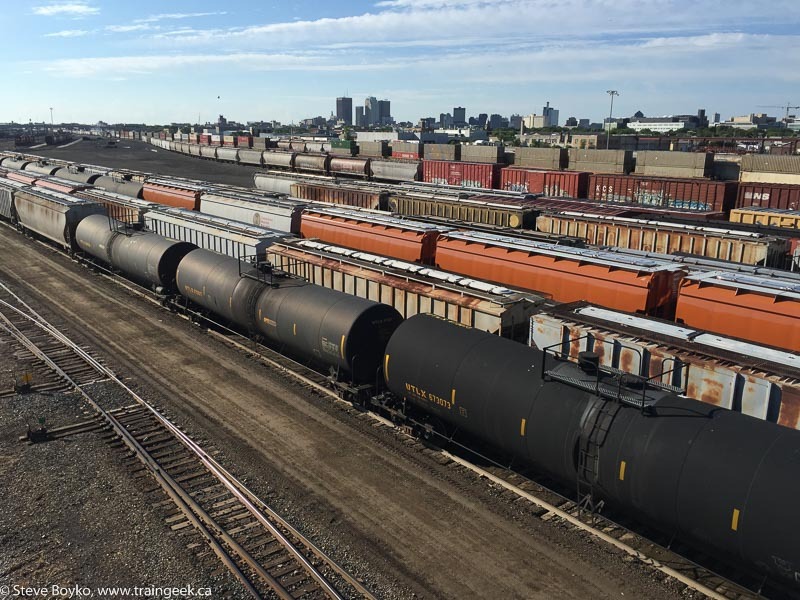 You may recall I mentioned the provincial Rail Relocation Task Force formed in January to investigate the options to move railway lines (mostly CP) out of Winnipeg. At the time former Quebec premier Jean Charest was appointed to lead this task force. Since then, we've had a provincial election and the Conservatives are now in power, and they've shown little appetite to continue with this study. UPDATE: the study has been cancelled. The study has a round figure of $300 million (-30%/+60%) to replace the bridge by 2020 with a new four-lane bridge. The current bridge is two lanes with steep approach ramps at either end. It is not pleasant to drive across and definitely needs some improvement. Personally I think CP needs to be heavily involved, as their plans for the yard would factor into this a lot. If you look at the yard today it is pretty empty compared to how it has been. 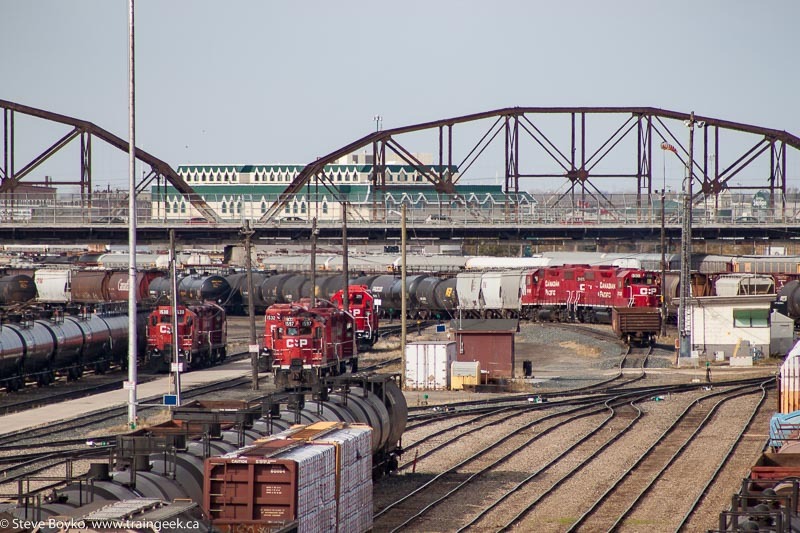 If CP was willing to narrow their yard somewhat, it would really affect the bridge design and perhaps location. I doubt that CP is really interested in reducing their capacity, though. I hope this doesn't become another huge boondoggle like the Waverley Street underpass, but it certainly has that potential. Another project to keep an eye on. 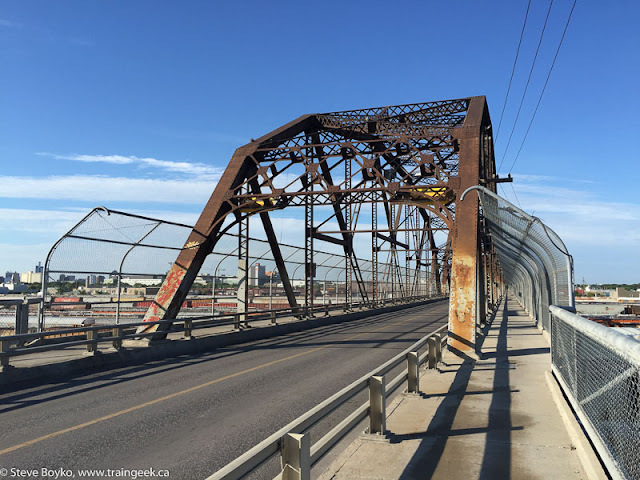 More on this bridge at Heritage Winnipeg's site. Here's a video I took several years ago of a pair of switchers going under the bridge. If it's coming down, I should be saving my pennies and pay it a visit before then. Something about old bridges makes me crazy. Great piece!